Despite the 935,000 Google hits for “slap with a wet fish,” I was not aware that it was such a common expression. I was vaguely aware of the delightful Monty Python skit, the “fish-slapping dance,” but as an icon of disdain and insult, “fish in face” had kind of slipped below my radar —or sonar, I suppose. The expression is still not as common in English as it is in Italian. To treat someone “a pesci in faccia” (fishes in the face) is a very common figure of speech in Italian, meaning to treat rudely; there is even a 2004 Lina Wertmuller film, Peperoni ripieni e pesci in faccia (Stuffed Peppers and Fish in the Face) with F. Murray Abraham and Sophia Loren. My etymological swamis tell me that It Started in Naples approximately 2,000 years before the film of that name with Clark Gable and Sophia Loren came out , a film actually set on the island of Capri, as was the original fish-in-face episode, so maybe there is some fishy connection—but I doubt it. Tiberius Caesar Augustus (42 BC–AD 37) was the second Roman Emperor, from the death of Augustus in AD 14 until his own death in 37. He has come down to us as someone with diritas —ill humor— insanely so, according to sources. He was given to meting out cruel punishments for any and all offenses, real or imagined. Various sources tell us that Tiberius put to death the inventor of malleable glass, after assuring himself that the inventor had not spread the word, so that “glass might not become as cheap as dirt.” He was also allergic to flattery, compliments, gifts, and tributes. He rebuked the Roman senators who wanted to rename his birth-month, November, after him in the fashion of “August” for his predecessor. (“Oh? Are you planning on having only 12 of us? That smells like a conspiracy. Guards!”) Some of that should have been a tip-off to the fisherman in the story that follows. 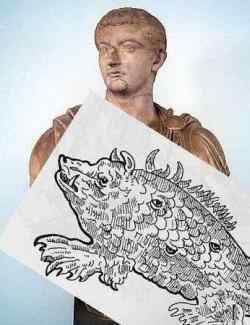 A few days after he [Tiberius] reached Capreae and was by himself, a fisherman appeared unexpectedly and offered him a huge mullet; whereupon in his alarm that the man had clambered up to him from the back of the island over rough and pathless rocks, he had the poor fellow's face scrubbed with the fish. And because in the midst of his torture the man thanked his stars that he had not given the emperor an enormous crab that he had caught, Tiberius had his face torn with the crab also. Put yourself forward in time again to, oh, 1982, when one slightly deranged, but harmless, Michael Fagan, scaled the walls around Buckingham Palace, shinnied up the drain-pipe to Queen Elizabeth II’s private apartments, and made his way into her bedroom (! ), totally by-passing the queen’s security personnel. Intruder and Majesty had a nice ten-minute conversation before the queen, under the guise of calling for a cigarette for the young gentleman, managed to tip off the guards, who came and escorted Michael out. If memory serves, no charges were pressed against him; no harm, no foul.